Beaches is another place we got vouchers for when we booked our tours through Wicked Travel so again, $18 per night for an 8-bed dorm was an offer we just couldn’t really refuse. 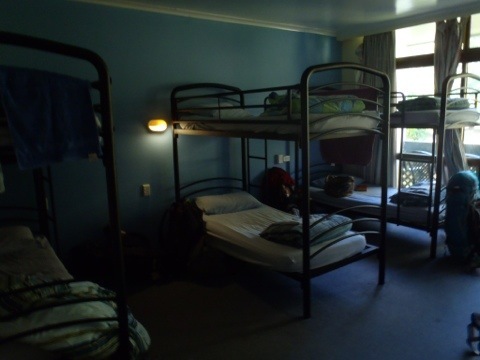 The dorms usually start at $25 per night and go up in price for the smaller dorms and private rooms. Both rooms we stayed in (before and after our Whitsundays sailing trip) were pretty spacious, with enough space for everyone to have their bags out and still walk around. Our second room was nicer as it had a lino floor instead of carpet, making it seem much cleaner. All the rooms have a balcony, ensuite bathrooms and a wardrobe/shelving area to store your stuff, which is particularly useful if you don’t want your clothes all over the floor! There is also a fridge and a sink in every room, although in our second room, there was no tap, which wasn’t the most handy thing in the world. The beds are pretty comfy too, although it depends how old your mattress is…my first bed had a big dip in the middle so all I could feel were the bars underneath, but my second bed was perfect. In terms of cleanliness though, this isn’t the greatest place I’ve stayed, that’s for sure. The bathrooms are pretty disgusting and really old…the tap in ours wouldnt turn off, which was so irritating, and there were even tiny cockroaches running around the floor…yeurgh! And I’m pretty sure there were bed bugs, although that could have just been the infestation of ants. I mean, seriously, they were everywhere…in the rooms, the bathroom, the kitchen, and even at the computer area in reception! The kitchen too, isn’t the best. It is pretty small, and very poorly equipped…you will struggle to find a fork, a cup, or even a hob that works…I think out of the twelve hobs, only four were in working use. And it is so so so hot in there – there is a useless fan and NO breeze…not what you want when you’re cooking and eating and it’s already about a gazillion degrees outside! There is also a fairly nice (but small) pool and TV room that’s so bad, it’s not even worth mentioning. Like many other hostels in the area, Beaches use Global Gossip Internet…they have two computers in reception and the wifi will reach certain rooms but not others (it just depends what side of the building you’re on). The best things about the hostel though, are the bar downstairs, which has live music every night, and the location. 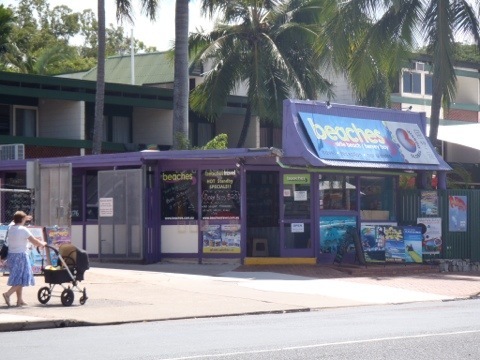 Beaches is on the main street, right opposite the supermarket and the Airlie Beach Lagoon, a nice place to hang out during the day. If we hadn’t had the vouchers, I’m not sure we would have chosen to stay here, but for $18 per night, I’m not complaining!